The campus is a lively and social place. IST Austria features an active and diverse campus life. 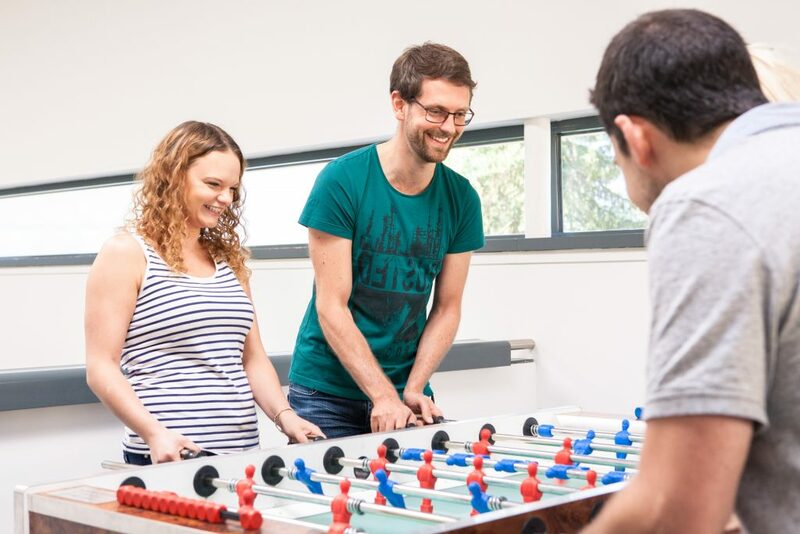 Scientists and administrative staff get together for social and cultural activities, ranging from soccer, volleyball, billiards and skiing to board games, movie nights, dancing lessons, pilates and yoga courses. IST Austria campus has fields for playing soccer or volleyball and is big enough to practice other ball games, Frisbee, etc. Sports equipment such as badminton sets, balls and boule sets can be borrowed for no charge from the guest house reception. A gym located in the central building offers all year round a wide range of regularly maintained fitness equipment. In addition to that yoga, pilates and back training courses are organized on campus. The long-established local tennis club (OBSV Maria Gugging) is located on campus and offers IST Austria employees special conditions. Ping pong tables and table soccer tables can be found in the basement underneath the “Crazy Duck” and throughout other communal areas on campus. Especially the annual table soccer tournament is an unofficial highlight in the social calendar of many IST Austria employees. In order to bring the campus community closer together, IST Austria organizes several institute-wide events throughout the year. These include the summer barbecue, at which families and friends are also welcome, the Institute Retreat, where employees have a chance to get to learn about each other’s work, and the Winter Bash, the Institute’s annual holiday party.